Fr. Roy, a native of the Southcoast of Massachusetts, grew up in the New Bedford area. The second eldest of six children, he attended St Joseph School as well as Bishop Stang High School. Fr. Roy earned a degree in philosophy from St. Mary College Seminary in Kentucky in 1971 and a Master of Divinity from St. John School of Theology, Brighton, MA in 1975. He was ordained a priest for the diocese of Fall River by Bishop Daniel Cronin on May 10, 1975. Fr. Roy became Pastor of St. Julie’s in the summer of 2012. Prior to his current assignment in Dartmouth, Father Roy has served many parishes in a variety of locations throughout our diocese including Taunton, Attleboro, Westport and Cape Cod. Through the years Fr. Roy has also served as the Chaplain of several Knights of Columbus Councils, as well as Spiritual Director for ECHO, Cursillo and Emmaus retreat programs. 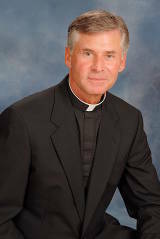 He has been Spiritual Director for Separated and Divorced Catholics, Engaged Encounter and Marriage Preparation programs. In addition he has represented the Roman Catholic Church to the Cape Cod Council of Churches and served as president of the Nauset (clergy) Interfaith Association.